21/11/2017 - The Moray town of Forres has been crowned as Scotland’s Most Beautiful High Street, after winning a public vote out of a final shortlist of ten towns competing for the title. See full results here. Photo: Photocall at Paisley Town Hall with Minister Kevin Stewart MSP (centre), representatives of competition organisers Scotland’s Towns Partnership and Keep Scotland Beautiful, and representatives of Forres (1st place) and Moffat (2nd place). Representatives of the Forres Area Forum and Forres in Bloom, who submitted the winning application, received a prize certificate from Kevin Stewart MSP, Minister for Local Government and Housing. Second-place finisher Moffat, and third-place Troon, also received certificates and congratulations. 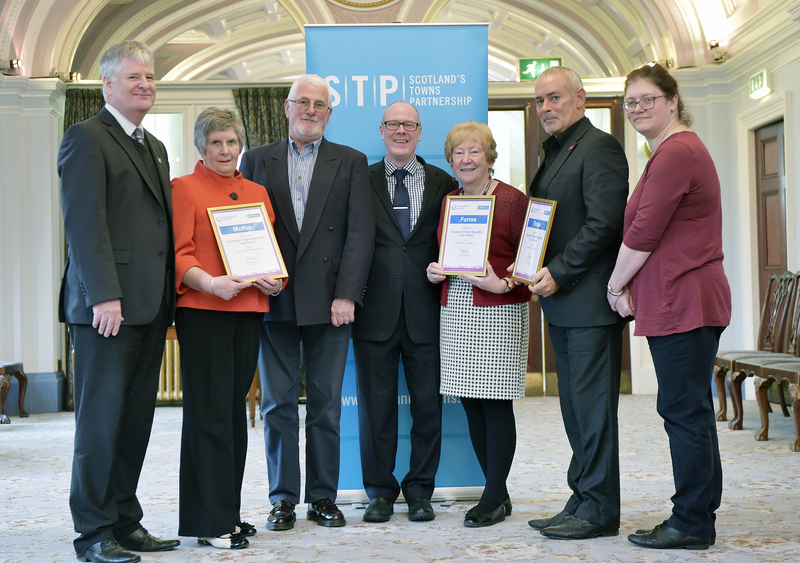 The results of the competition were announced in Paisley Town Hall during Scotland’s Towns Conference, the annual gathering of all those who work to improve the country’s towns and city districts from across sectors and communities. The Most Beautiful High Street Competition was organised by Scotland’s Towns Partnership and environmental charity Keep Scotland Beautiful to celebrate the contribution of Scotland’s High Streets and recognise the efforts made to make these spaces clean, attractive, accessible, vibrant and inclusive for all to enjoy. The competition was launched in the Sunday Herald, and encouraged local authorities, business improvement districts, development trusts, community councils and any other local organisation to get involved. The shortlisted towns, selected from applications received by Keep Scotland Beautiful and STP, were: Alloa, Banff, Elgin, Falkirk, Forres, Fort William, Haddington, Lanark, Moffat, Troon. “I wish to congratulate Scotland’s Towns Partnership and Keep Scotland Beautiful on the success of the first ‘Scotland’s Most Beautiful High Street’ competition. The ten shortlisted entries were of a high standard and a big congratulations must go to Forres on winning the title through the public vote”. “We want our town centres to thrive as attractive, vibrant assets and it is encouraging that communities across Scotland are working hard to ensure good quality environments which are attractive to people and businesses”. “According to Rough Guide, Scotland is officially the most beautiful country in the world, second only to London on global bucket lists. However, when you ask someone what is the biggest problem with their town, they will often mention dirtiness or litter”. “Therefore we teamed up with Keep Scotland Beautiful to launch the inaugural Most Beautiful High Street competition, an award to recognise those who see the importance of getting the basics right. Clean and tidy, then beautification, followed by investment”. “An attractive environment is important for social and community wellbeing, in addition to the potential economic benefits. Indeed, in the Year of History, Heritage and Archaeology, Visit Scotland predict a bumper season – and there is measurable growth in the context of Golf Tourism and the Scottish Open, the Cruise Market, Staycations and Holiday Parks, Outlander fans, The Whisky Experience, the North Coast 500 and Heritage Holidays”.